Confirming what we posted on February 3, there will be two Aston Martin DBR9s at Sebring next month, for the 54th running of the Mobil 1 12 Hours. “We are delighted to be back in the US which is an important market for us and racing at Sebring where we achieved such a good result last year,” commented Dr. Ulrich Bez, Chairman and Chief Executive Officer of Aston Martin. The Corvettes will carry a modest weight penalty this year, the DBR9s consistently running a fraction off C6.R pace whenever they meet in North America in 2005. The Aston Martins had the edge on speed at Le Mans though. 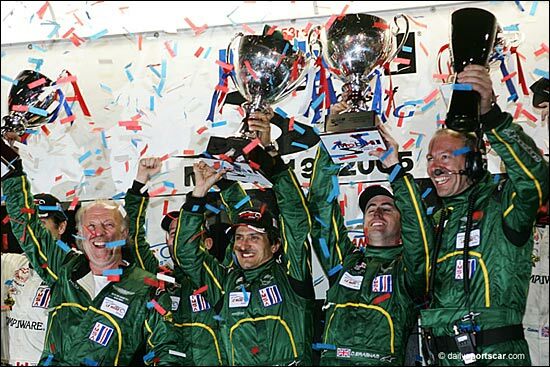 No word on drivers for Sebring yet – or plans for the balance of the 2006 ALMS season. This was the scene at Sebring after the 53rd running of the 12 Hours.